X-Mirage Inc. has released the multilingual version of X-Mirage for Mac 1.06.3 and X-Mirage for Windows 1.01.3, which support English, French, Japanese, Russian and Simplified Chinese. Users can download the updates here: http://www.x-mirage.com/download.html. For new users, it will automatically display the same language as your System language. 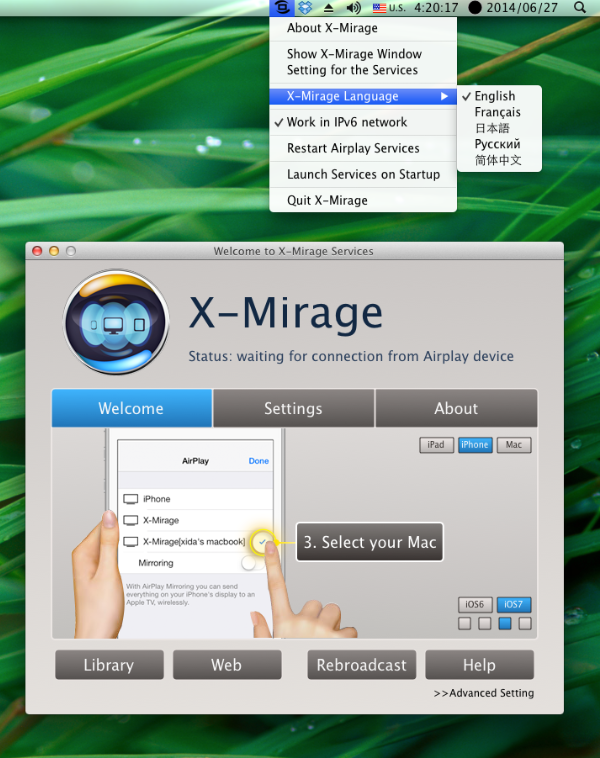 For existing users, click the X-Mirage icon on the menu bar and then X-Mirage Language option to switch languages when running the new version for the first time. Our sincere gratitude and respect go to our kind-hearted volunteer translators Oleg T(Russian version), Maxime Lefebvre(French version) and Jin Xiangkun(Simplified Chinese version). Your contributions will benefit our millions of users around the world.